LOUISVILLE, Ky. and TAMPA, Fla., /PRNewswire/ -- Each year, as many as 20,000 young people "age out" of the foster care system many without strong family relationships or community connections to help them navigate their lives ahead. In Kentucky, these young adults age out of the foster care system at 18 years old and are faced with a number of important life decisions to make around their health, safety and education. According to statistics, 25 percent of aged-out foster youth experience homelessness in their first four years on their own; are at seven times the rate compared to their non-foster care counterparts for drug dependence; and only 25 percent of foster youth are in college versus 41 percent of the general population. 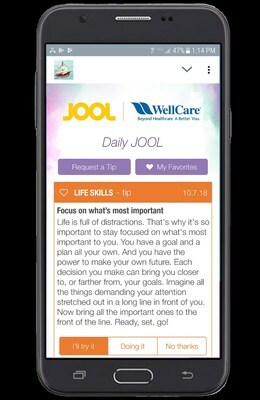 To help improve outcomes for these young adults, WellCare of Kentucky, a WellCare Health Plans, Inc. (NYSE: WCG) company, in collaboration with JOOL Health, an advanced well-being and technology company, is offering its young members a virtual life coach focused on goal-setting and self-tracking. The smartphone application is available at no cost to 250 WellCare Medicaid members who are in the Kentucky foster care program and are 17 years of age. Findings from the Deloitte 2018 Survey of US Health Care Consumers show that most adult Medicaid beneficiaries own mobile technologies, use them for a variety of health purposes, and are interested in trying new digital health applications in the future. "Lack of purpose in life has a profound impact on the health and well-being of young adults, especially those in the foster care system," said Bill Jones, president, WellCare of Kentucky. "Purposeful living is linked to a longer life, lower risk of disease and healthier behaviors. By coaching these young adults to make better decisions, we aim to help them live better, healthier lives." Through the program, WellCare care managers will work with members to assist them with the onboarding process to establish a starting point on three social and health dimensions. Specifically, each member will complete a health risk assessment; choose his or her top core values; and identify four purposes (personal, family, work/school and community). For example, a school purpose could be, "I want to be on time every day and exceed the expectations of my teachers." Once onboarding is complete, the member will enter daily self-reports into the application regarding his or her purposes, goals and targets. The app then engages each member across five key areas of behavior: sleep, presence, activity, creativity and eating (S.P.A.C.E.) along with two other areas of focus—energy and willpower. Over time – and based on the member's inputs and daily self-reporting – the app delivers personalized tips, guidance, insights and support that members can draw on to achieve and sustain better health and well-being. "Based on our research, our program has recorded fundamental and sustainable positive behavior changes in users beginning in as little as 10 days. This behavioral change fuels meaningful engagement and improvements in many other areas of life. Users are frequently more receptive to change and resilient in the face of adversity and stress, two factors known to negatively influence well-being and productivity outcomes," said Vic Strecher Ph.D., MPH, founder and CEO of JOOL Health. As of Sept. 30, 2018, WellCare serves approximately 448,000 Medicaid members, 13,000 Medicare Advantage members and 22,000 Medicare Prescription Drug Plan members in Kentucky. To learn more about how WellCare cares for Kentuckians, watch Brandi's story at http://youtu.be/YwOw5EgeSYo. Headquartered in Tampa, Fla., WellCare Health Plans, Inc. (NYSE: WCG) focuses primarily on providing government-sponsored managed care services to families, children, seniors and individuals with complex medical needs primarily through Medicaid, Medicare Advantage and Medicare Prescription Drug Plans, as well as individuals in the Health Insurance Marketplace. WellCare serves approximately 5.5 million members nationwide as of September 30, 2018. For more information about WellCare, please visit the company's website at www.wellcare.com.